Who says shelving needs to be boring? Would you like your shelves to be a thing of beauty in themselves, and not just somewhere to dump books and things you want off the floor? Have we found the designers for you. Chiaozza is a New York-based design partnership founded in 2012 by Terri Chiao and Adam Frezza. 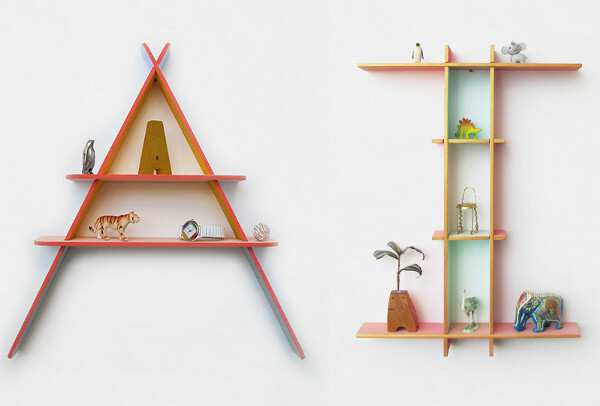 A shared interest in Danish folk design and sculpture led them towards the creation of their range of A-frame shelves and alphabet shelving. 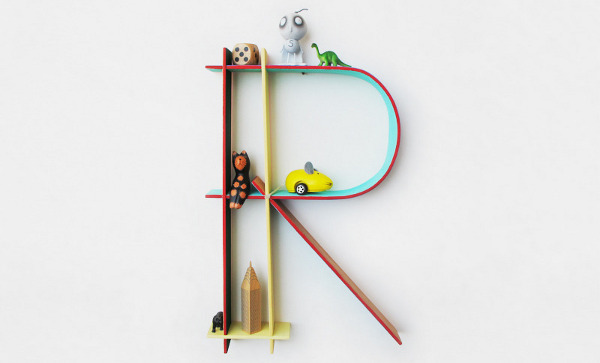 Although these pieces aren’t specifically aimed at children, I can hardly think of a child who wouldn’t love their own initials made into shelving for small, treasured objects. All the shelves are handmade to order, cut by hand and the wood is curved using steam to bend it. Since there is no glue involved, all the pieces can be disassembled and flat packed to deliver to you. Because the alphabet frames are all made to order, you are free to choose colours you like to match your decor. Chiaozza’s custom alphabet frames are US$250 each, and you can get all the details and talk with the designers at Chiaozza.